The term ‘conversion’ (from Latin ‘conversio’ – change, transformation) is used in different fields: economics, industry, marketing, finance, psychology and even linguistics. If, for example, in defense industry this word is now not as topical as in the period of reduction in defense in the 1990s, in urbanism, on the contrary, conversion (reconsideration of urban quarters and even districts) is a point of interest among town planners and architects. It concerns first of all the city districts that were abandoned as a result of industrial decay in the same 1990s. Let’s try not to forget that conversion is not only loss of old meanings, but also acquisition of new ones. GRIGORYEVA, Elena. Conversion. project baikal, Russian Federation, n. 55, p. 1-1, apr. 2018. ISSN 2309-3072. 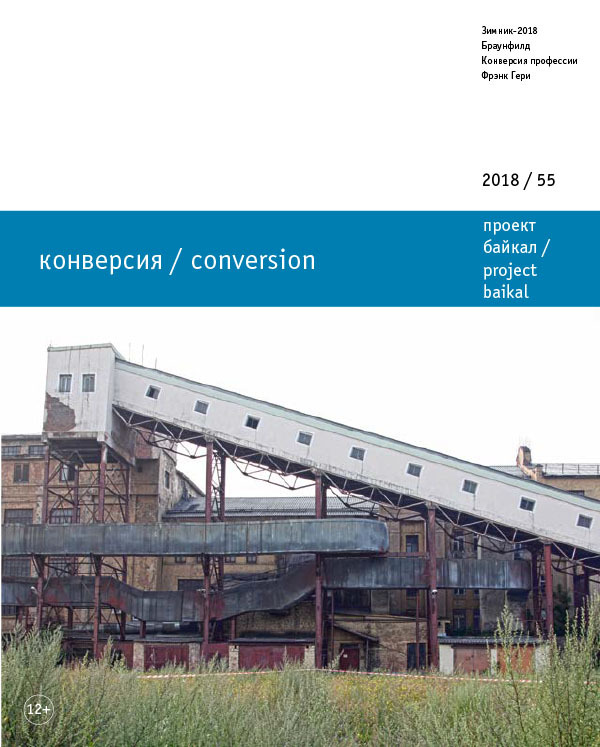 Available at: <http://projectbaikal.com/index.php/pb/article/view/1269>. Date accessed: 22 apr. 2019. doi: https://doi.org/10.7480/projectbaikal.55.1269.